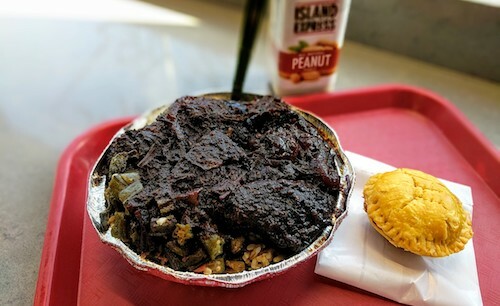 If you are a Caribbean person living in South Queens or Brooklyn, or just love good food, chances are you have heard of and love Sybil Bernard. Her first bakery opened in 1976, offering Guyanese bread and pastries that quickly became beloved and eventually expanded to two other restaurants. The fourth has recently opened in Flatbush, Brooklyn and resembles a fast food burger joint on first glance. Fortunately it is much better, all of the Guyanese favorites are just as good as always. The graphics game is on point, and the walls tell the story of Sybil, her children, and this Guyanese empire. It also includes her photos from younger years and a few select quotes that frame her as a no-nonsense woman. The menu is compact but offers all the Guyanese and Caribbean favorites including roti and curry. There is also a bakery side, getting back to her roots and showcasing her many skills. 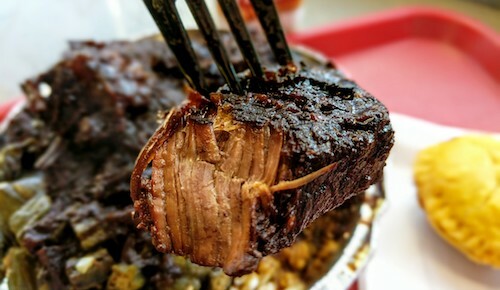 Off the menu, but sometimes available is pepper pot ($12, above and below), a stewed beef dish made with Caribbean hot peppers, cinnamon, and a cassava root-based sauce called cassareep. The second half of the name comes about because this is a dish usually reserved for special occasions or holidays, and cooked in a large pot for many servings. This should be eaten with white rice, which will turn brown and soak up all the good gravy. It comes with a choice of one side, which will be added to the plate and also covered with gravy. 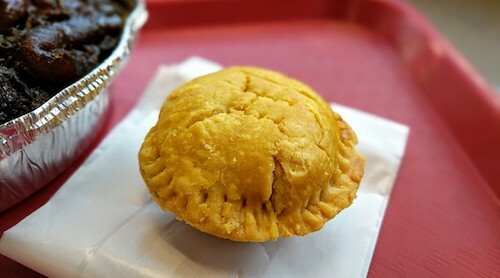 The bakery skills of Sybil have always shown through with her Jamaican-style patties, which can also be purchased here in a small size called cocktail patties ($1.50 each, below). The well-seasoned meats are covered with perfectly flaky crust. 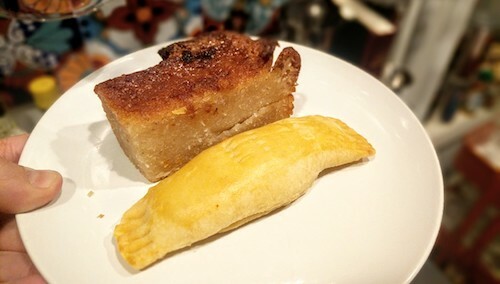 Other treats from the bakery include a thick and sweet yucca and coconut "pudding" called pone ($2, below) and the cheese roll ($1, below) which is not unlike the patties but filled with slightly spicy cheddar. 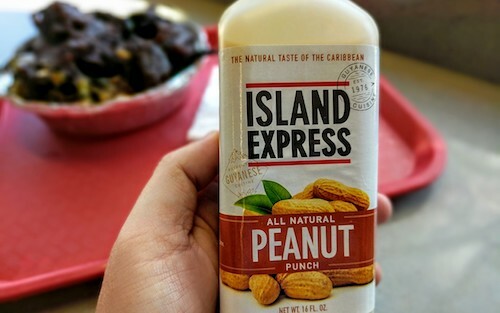 Also available are homemade Caribbean drinks like sorrel and mauby, and something I can never resist, the peanut punch ($3, below). Caribbean people fly the flags of their country everywhere, but often times a restaurant will have an awning that says "West Indian" on it instead of being specific. I think it is great that Island Express proudly prints "Authentic Guyanese Cuisine since 1976." 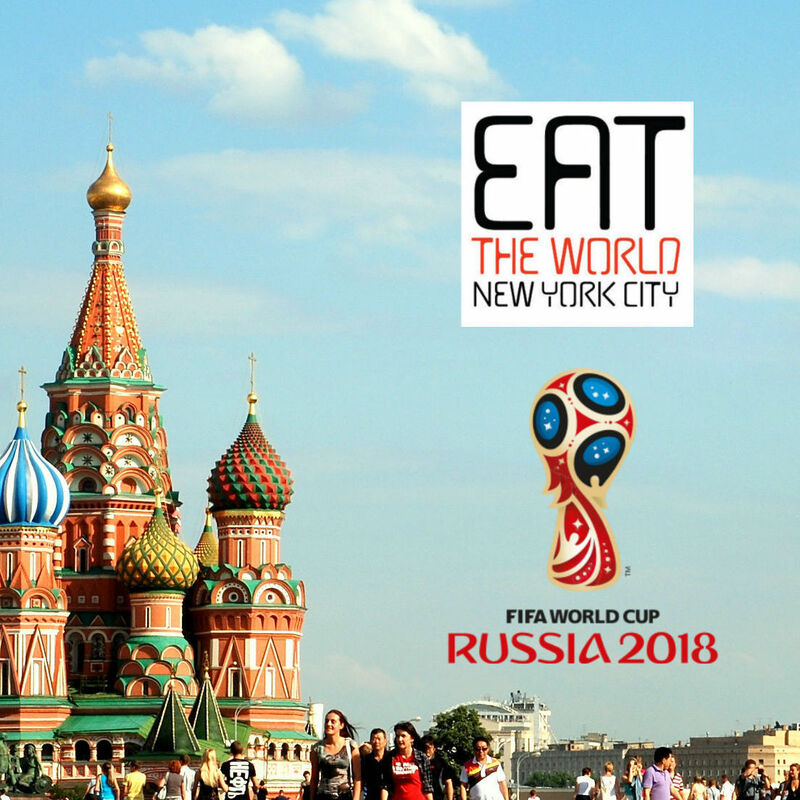 If you have ever felt intimidated by some of the Caribbean steam table restaurants written about on these pages that do not really have a self-explanatory menu and require some guess work, this is a "user-friendly" place to start.